Data-driven focus prompts increased use of test plots. What pays and what doesn't is key to Ethan Zoerb with today's tight margins. In this environment, test plots play an even bigger role for the data-driven Zoerb as he looks for new ways to sharpen management tools and boost yields. That is as true for new products as it is new technology. "We will be doing even more plots than in the past as we try new products and evaluate how or whether they pay," says Zoerb. "On the corn equipment technology side, we are putting any new components on our 12-row planter this year before adding them to our 24-row planter. We can compare old and new ways and see if the benefits justify adding them to the larger planter." The new components he is testing include a Martin-Till 2 x 2 x 2 fertilizer system and Furrow Jets from Precision Planting. Mounting both on the same planter and comparing them to the larger planter will give Zoerb the data needed to decide which to adopt next year. Zoerb will stick with his proven products, such as Priaxor and Headline AMP, but they will have to prove themselves as controls against competitive options in plots. He also plans to try some biologicals, sugars and fungicide inoculants on his soybeans. In mid-March, he and his father, Dale, were still hashing out exactly what products to trial. "We are trying to improve emergence, getting the seed out of the ground more evenly for the best shot at best yields," says Zoerb. Improving the return in today's market goes beyond products and equipment for Zoerb. He plans to add some white corn acres. If no premium is available, he still has a market at a nearby ethanol plant. "In the future, we may take a look at some non-GMO corn as well," says Zoerb. "We have a bagger, which gives us flexibility on identity preservation as well as storage generally. It means the combine doesn't have to stop while we stand in line at the elevator, and we can hold on for a better basis when marketing, especially with soybeans." Zoerb is exploring other marketing tools with his conventional corn and beans. "I'm looking at using some puts and calls in case prices go up," he says. "It's another way to sell at a profit without holding on to the grain and waiting for the market to improve." 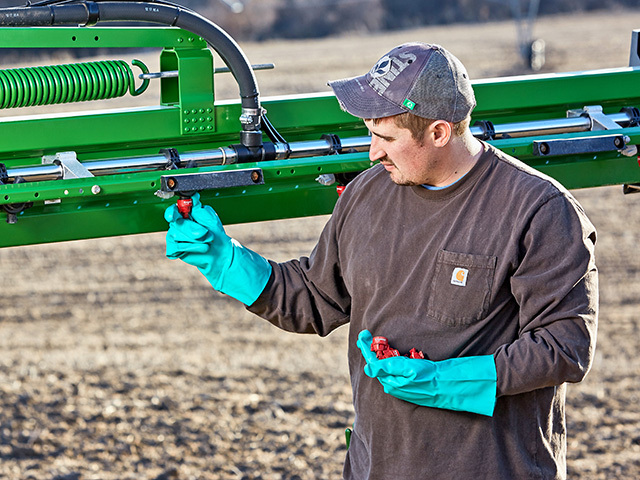 Increasing yields through new products or equipment components, changing practices in the field or improving marketing are all designed to carry the Zoerbs through the current extended period of tight margins. They will also help him with his long-term goals. "We are starting to see some ground come up for sale or rent, but with today's prices for crops and land, we would barely break even," says Zoerb. "I want to grow, but I have to be smart about it. I've discussed it with our lender, and he stresses looking at the numbers. Perhaps in a year or two, it will be my opportunity. In the meantime, we have to stay profitable, and that's tough to do."